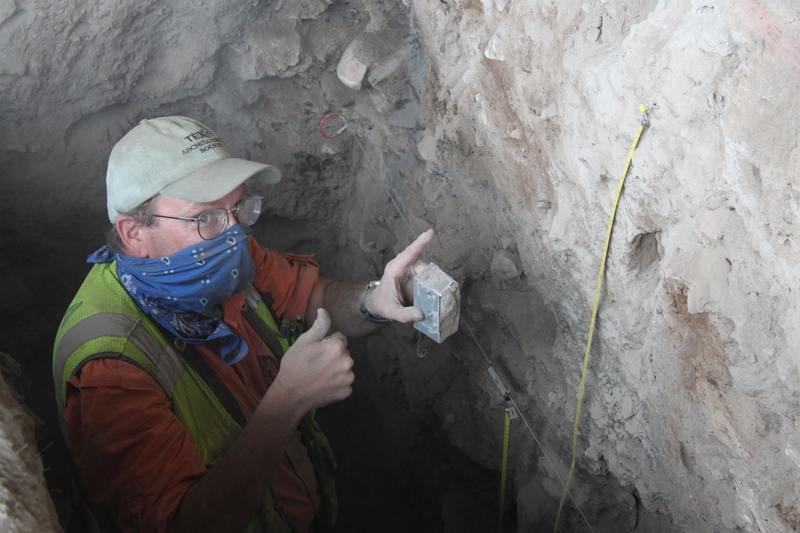 I recently had the chance to work with Geoarchaeologist Dr. Charles Frederick. He invited me out to his laboratory (about 90 miles southwest of Fort Worth) for a few days so we could analyze the samples taken from Eagle Nest Canyon during his most recent visit. 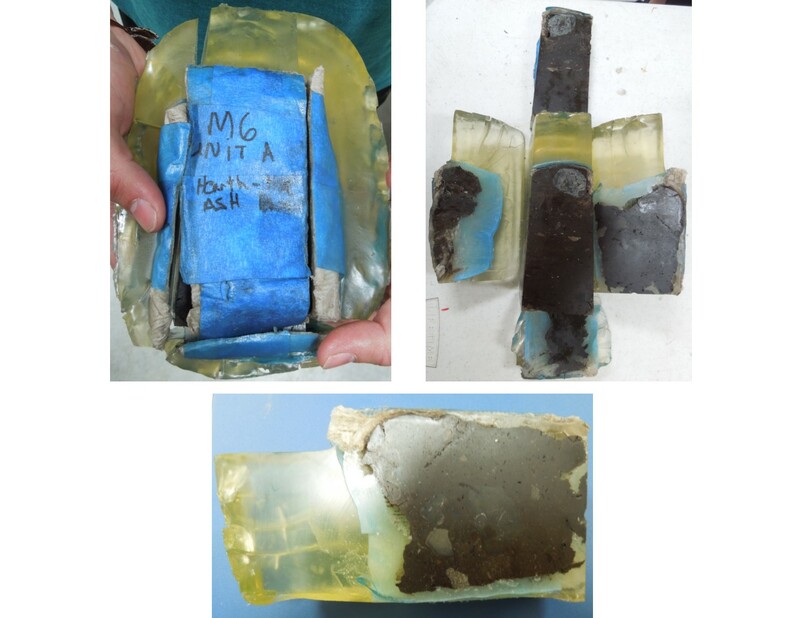 These included micromorphology and magnetic susceptibility samples from Kelley Cave as well as sediment samples from a small rockshelter opposite Skiles. The micromorph endgame is to create thin sections of the intact stratigraphy which can be analyzed under the microscope. The micromorph samples were impregnated with resin and left to solidify and dry for two weeks in a shed in Langtry before being transported to the lab. However, two weeks and several layers of plastic containers did little to dispel or contain the toxic fumes wafting from the samples. But, for the sake of science, I drove the entire way with the car windows rolled down and made it—thankfully—without turning into an archaeo-popsicle. Ken Lawrence with a successful micromorph extraction. My role in this process was to prepare the thin section blanks. I did this by trimming the ends of the micromorph samples as well as any excess resin, thereby exposing each face of the micromorph sample, and allowing Charles to decide the best locations for thin sectioning. Many of the laboratory procedures require multiple days to complete, and micromorph sample trimming is no exception. It takes three hours to trim one sample using a mineral oil lubricated rock saw. Thanks to the saw’s automatic shut-off I was able to complete other tasks in the interim. Articulated and dis-articulated micromorph sample. 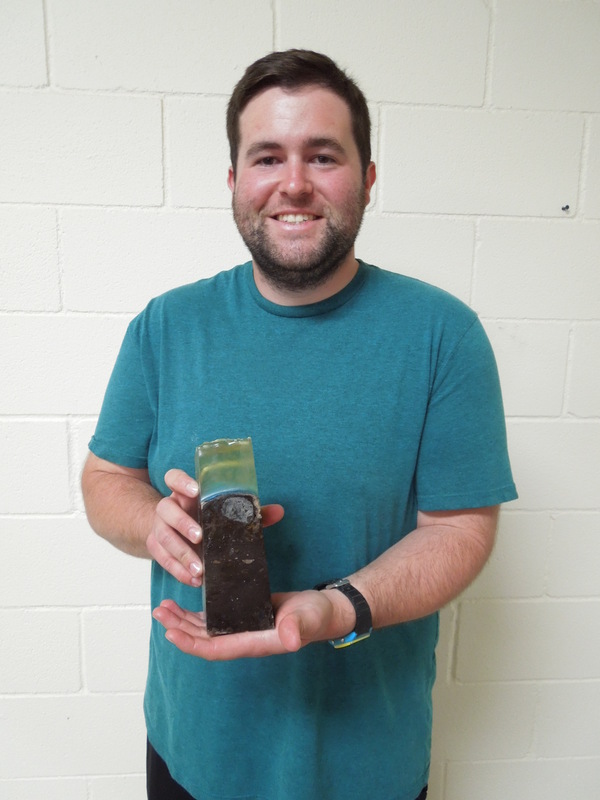 One of the other tasks was to test the magnetic susceptibility of samples taken from the various strats of the north profile of Unit A in Kelley. Magnetic susceptibility analyzes the degree of magnetization of sediment. This is of interest to archaeologists because an elevated level can be indicative of biological activity through the fermentation process as well as burn events. As interesting as the science behind this analysis is, the actual lab process is quite simple. In Charles’ own words, “this is something a monkey can do.” I weighed each sample cube and then placed them in the magnetic susceptibility meter, recording the low and high frequency readings. 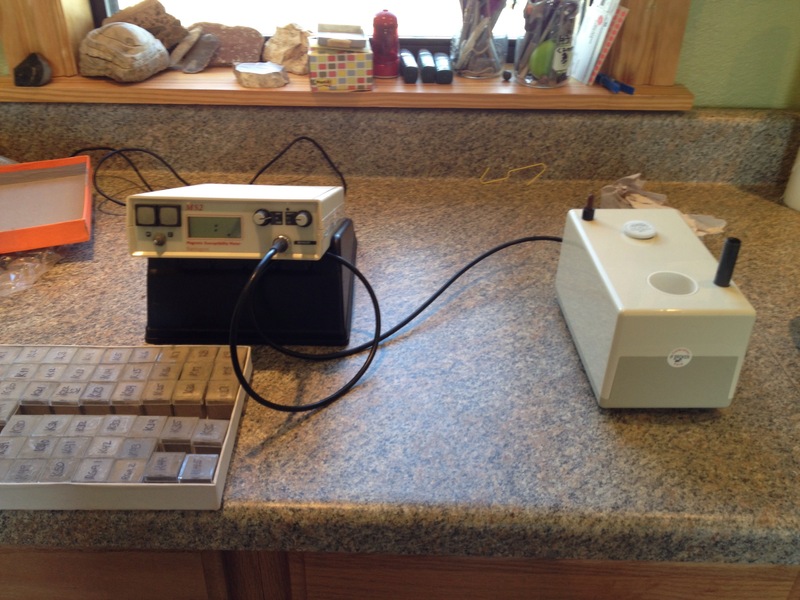 Magnetic susceptibility meter and samples. The last thing I did before leaving for the Lower Pecos was analyze the grain size of matrix samples using a sieve and hydrometer. Sieves are used for quantifying the large fraction particle sizes and hydrometers the small. A sieve is a series of stacked screens that go from large to small with respect to the size of particles a single screen will allow to pass. We used a shaker that utilizes sonic waves to vibrate the particles through the sieve. The particles left on each screen were then weighed and recorded. The hydrometer analyzes the small particles based on measuring the rate at which particles descend and settle in a water column at a constant temperature. I had a lot of fun helping Charles and am very appreciative of him showing me the ropes of a geoarch lab. I will continue assisting him in processing many more samples in the near future. And as we learn more about micromorphology we will be sure to share our results. This entry was posted in Geoarchaeology, Spring ENC 2014 Posts. Bookmark the permalink. You guys are certainly getting a great experience!